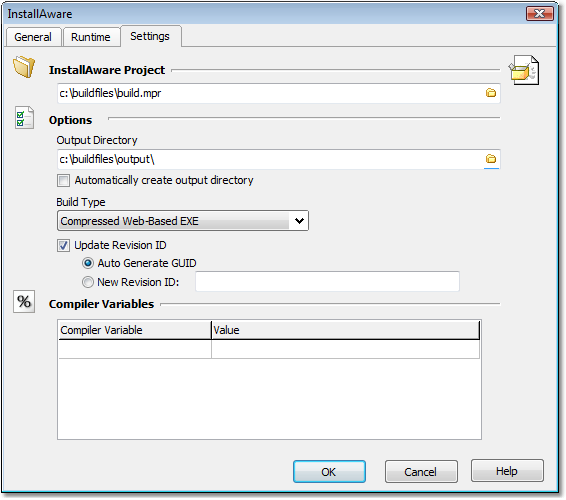 The InstallAware action enables you to automate the process of building InstallAware installations. This will modify the InstallAware project file with a new Revision ID. The revision ID uniquely identifies the setup to Windows Installer. Each revision should have a new Revision ID otherwise Windows Installer will attempt to do a Repair/Remove instead of uninstalling an old build and then running the new build. FinalBuilder will automatically generate a new GUID for the RevisionID each time the action runs. Specify the new Revision ID that you want this version to have.